Product prices and availability are accurate as of 2019-04-19 20:27:44 PDT and are subject to change. Any price and availability information displayed on http://www.amazon.com/ at the time of purchase will apply to the purchase of this product. The best-selling bariatric cookbook, with more than 125 low-carb, low-fat, high-protein recipes for patients to enjoy after weight-loss surgery. In April 2003 Patt Levine underwent "Lap-Band" gastric surgery, one of the primary bariatric surgeries being widely practiced today. As a lifelong foodie, she was expecting the worst when her surgeon's nutritionist handed her dietary guidelines to follow post-surgery, and she was right. With her decades of cooking skills, she immediately set out to devise low-fat dishes that would be just as delicious pureed and chopped as they would be served whole. As an added problem, she wanted to cook for her husband at the same time. 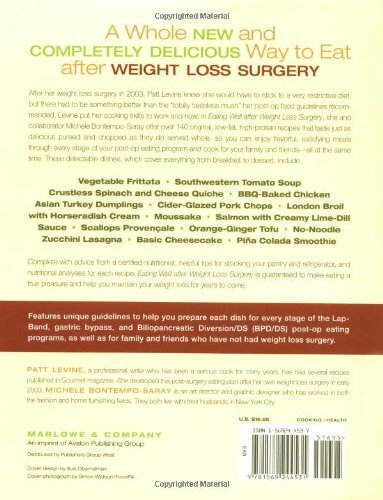 This first-ever cookbook for the hundreds of thousands who are lining up for bariatric bypass surgery is proof that it can be done. With collaborator Michele Bontempo-Saray, the author has created 125 recipes that contain no added sugar, are very low in fat, and get their carbohydrates almost exclusively from fruits and vegetables. 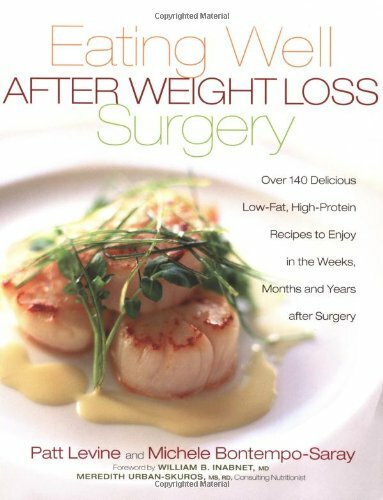 Each recipe includes specific guidelines for preparation of the dish for every stage of the eating programs for Lap-Band, gastric bypass, and Biliopancreatric Diversion Duodenal Switch (BPD-DS) patients, as well as suggestions for sharing meals with those who have not gone through gastric surgery. Creative recipes cover every meal and food-breakfast and brunch, soups, vegetables, main courses, and sweet indulgences.